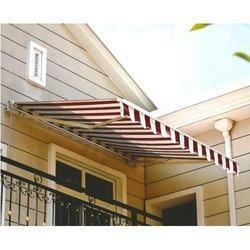 We are engaged in the business of manufacturing and providing services of Terrace Awning. These Terrace Awning are durable and water proof in nature. The product range is available in various stylish patterns and colors and is ecstatic in designs. These find usage in home, office, restaurants and many other places o provide shed from rain and also from sun. The range can be availed at highly affordable prices. Since 1999, we, 'Tuffcoat Awnings Systems', have been recognized as a prominent manufacturer and supplier of a wide array of Awnings, Tents & Garden Umbrellas. The range offered by us encompasses Garden Umbrellas, Demo Tents and Commercial Awnings. These are manufactured using optimum quality raw material employing contemporary machines and technology. Our products are highly appreciated for their features like heat resistance, easy installation and high durability. Backed by a team of diligent professionals, which assists us in accomplishing all the trade activities. All our experts are extremely dedicated, sincere and honest towards their tasks. Moreover, the experts of our organization work in close consort among each other as well as with the patrons to know their exact needs and serve them, accordingly. Further, these experts frame all the work in our widely spread infrastructure. This facility is installed with all the necessary amenities that are required for smooth running of all the trade processes. Owing to the perfect blend of employees and vast infrastructure facility, we have been able to garner a huge clientele across the nation.